It is widely reported that Cirque du Soleil, world-renowned performing art group from Quebec, Canada, opened a permanent venue in Tokyo Disney Resort earlier this month. 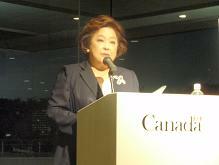 In order to commemorate this special development, the October meeting of the Global Communications Platform seminar series was held, focusing on the relationship between Japan and Canada in a broader context of North America as well as in a well-focused context of Japan-Quebec relations, at GLOCOM Hall on 10/21(Tue) 4-6pm. The first speaker was Mr. Daniel Dignard, Director of Economic Services, Delegation Office of Quebec Government in Tokyo, who gave a talk in English about economic relations between Japan and Canada with reference to NAFTA on one hand and Quebec on the other. Mr. Dignard emphasized the positive effect of NAFTA on Canada, especially on Quebec, and suggested a number of areas, such as science and technology cooperation, where Japan can benefit from a closer relationship with Canada in general and Quebec in particular. Association for Quebec Studies in Japan, and explained in Japanese about the cultural and histrocial background of Quebec and its significance from the viewpoint of Japan. 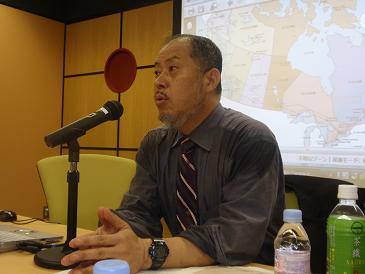 Prof. Obata vividly described the attractiveness of the Quebec literature, performing arts, and other cultural activities, and pointed out an increasing interest in Quebec on the part of many Japanese scholars and students, leading to his inititative in launching a new association for Quebec studies. After the presentations, a free discussion took place, and many interesting questions and commments were given by participants including a former ambassador to Canada, and a representative from the Canadian Embassy in Tokyo. 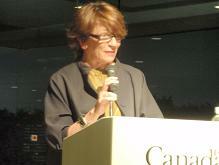 In particular, some merits and demerits of using French as the main language in Quebec were discussed. At any rate, there seem to be a lot of good opportunities for Canada, Quebec and Japan to develop mutually beneficial relations in various fields, from culture and society to business and technology. 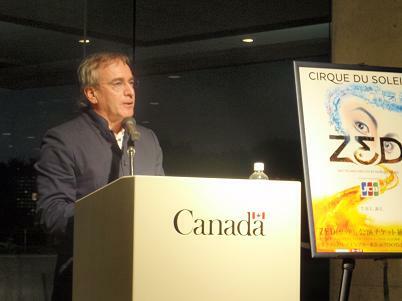 On October 2, a special event, featuring Mr. Daniel Lamarre, president and CEO of Cirque du Soleil, was held at the Embassy of Canada, organized by the Canadian Embassy and the Delegation Office of Quebec Government on the occasion that the permanent venue of Cirque du Soleil with a new show "ZED" was just opened at Tokyo Disney Resort. Mr. Lamarre first mentioned that after Las Vegas, Tokyo is Cirque du Soleil's number one city in terms of ticket sales, and then eloquently explained the secret of his company's success, emphasizing "creativity" as the main value to maintain and promote over monetary returns. He said "we are dreamers," and "dedicated to creation, production and performance on artistic works whose mission is to invoke the imaginations, provoke the senses and evoke the emotions of people around the world." Mr. Lamarre also pointed out that social values are equally important and one percent of the revenue (not the profit!) has been contributed to social causes with a new foundation just established to do more, such as "One Drop" to help solve the water problem on the global scale. After the presentation, he was willing to answer some questions from the floor, regarding the recrutiment and training of their talented people, and Japan's contribution to their artistic as well as business success. 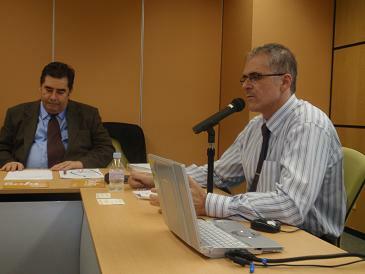 It was such an impressive event that must have satisfied everyone who attended. 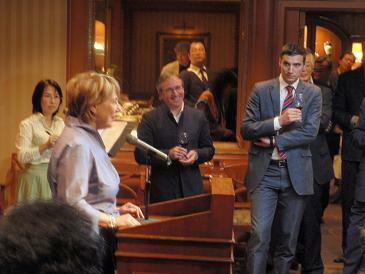 The presentation session was concluded by Ms. Suzanne Ethier, Tokyo representative of the Delegation Office of Quebec Government, to be followed by a reception which was hosted by Ms. Christine St-Pierre, Quebec Minister of Culture, Communications & Gender Equality.